The ATLA Products Blog is sharing the stories behind our product offerings, and this month’s posting highlights new full-text titles from ATLASerials PLUS® (ATLAS PLUS®). Here’s an excerpt from the ATLA Products Blog. Tübingen, Germany-based Mohr Siebeck has been a leader in the academic publishing world since 1801. With a focus on humanities and social sciences, their content is a go-to for scholars in fields such as law, economics, history, and fortunately for ATLA, theology. They publish robust subject lists every year via books and series and also have an extensive journal list covering everything from Classics to Cultural Studies. In the increasingly competitive academic journal market, Mohr Siebeck content has thrived. They have produced some of the most enduring journals in this space and continue to establish new one–particularly since 2000–as the need for subject coverage expands. 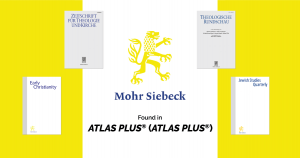 We at ATLA have been lucky to work with Mohr Siebeck for many years. They are a regular exhibitor at ATLA conferences and directors from the ATLA offices have visited their headquarters while in Germany. Their journals in the field of religion and theology are highly respected and sought after by scholars in our field. We index seven of their titles and currently license four in ATLASerials PLUS® (ATLAS PLUS®) as full-text from the Theology, Jewish Studies, and Religious Studies lists, respectively. We are grateful for this collaboration with Mohr Siebeck and know our users are too. More information about each full-text title can be found below. Read the whole story on the ATLA Products Blog. ATLA offers a prestigious product line of electronic resources to support the scholarly study of religion and theology and we want to share with you the stories behind the journals that have been carefully curated for our users. So, we have created the ATLA Products Blog to give an insider’s perspective and spotlight just some of the journals found in our databases.